Blazon of the Badge of Carrick Pursuivant : A Chevron Gules, enfiled of a coronet of four fleur-de-lis (two visible) and four crosses pattée ( one and two halves visible ) Or. Historically the badge is based on the chevron of the old Earldom of Carrick held by Robert the Bruce and his ancestors. 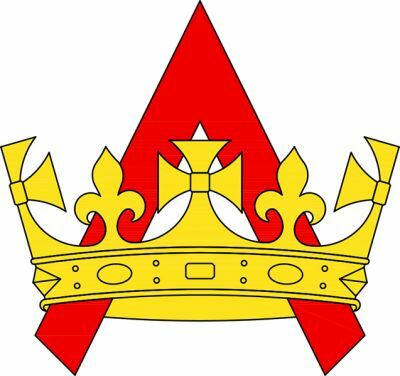 The title of Carrick Pursuivant is the oldest apart of that of the Lord Lyon King of Arms. It appeared as early as 1365 for John Trumpour in the Register of the Great Seal. SOURCE, NOTES & CREDITS: Text for blazon and history from page 81, "The Double Tressure", No. 20, 1998, in an article "Badges of the Scottish Officers of Arms" by Mrs. C. G. W. Roads, then Carrick Pursuivant of Arms. We have here the Badge of Carrick Pursuivant of Arms in Ordinary, who is George Alexander Way of Plean, appointed 4 December 2017 and who was formerly Falkland Pursuivant Extraordinary. The most recent previous holder of this office was Mrs. C. G. W. Roads, who was promoted Snawdoun Herald of Arms in Ordinary 17 December 2010.